Whitesnake are planning to release a new video on Valentine’s Day. The band revealed the news in a short video teaser titled A Whitesnake Video Event which can be watched below. The clip shows shots of the band onstage, along with a graphic of their logo – and a guitar riff can be heard in the background. It’s possible it could be the single Shut Up & Kiss Me from Whitesnake’s new studio album Flesh & Blood, which the band previously revealed would be released prior to their 2019 tour dates which get under way in April. All will be revealed on February 14. 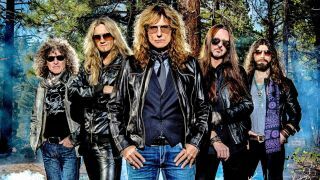 Regarding their upcoming tour dates, Whitesnake frontman David Coverdale previously said: “We are truly excited and looking forward to playing across the globe in 2019 on what will be a continued celebration of the 40th anniversary of Whitesnake. “I am so honoured and grateful to have toured this incredible world we share for over 40 years, celebrating and enjoying unforgettable moments with millions of people – all of whom have joined me on this amazing journey. Meanwhile, Whitesnake’s 1984 album Slide It In will be re-issued as a deluxe edition on March 8 to celebrate its 35th anniversary. It’ll feature alternative mixes, music videos and previously unreleased live and studio cuts.